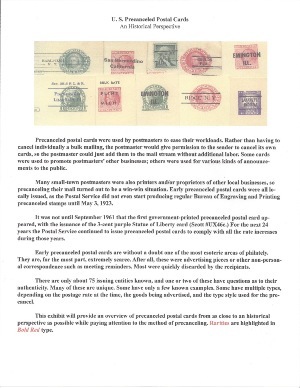 APRL acquisitions, February 16, 2013-March 15, 2013. 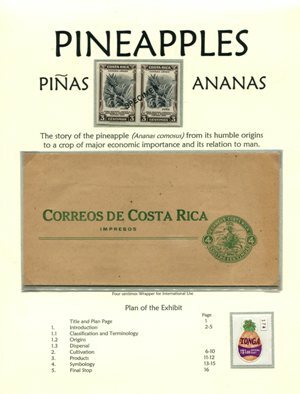 To request loans, copies, or scans, or to search our catalog, visit the APRL website. 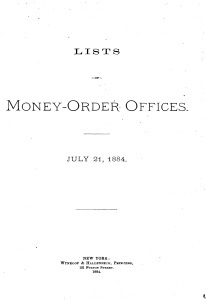 In this month’s listing, you’ll notice quite a few lists of money order post offices. 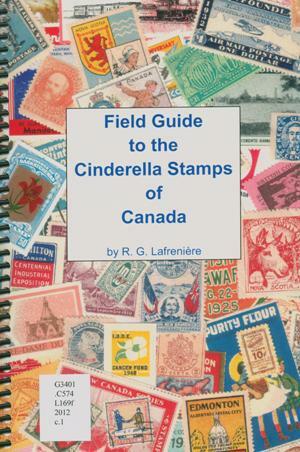 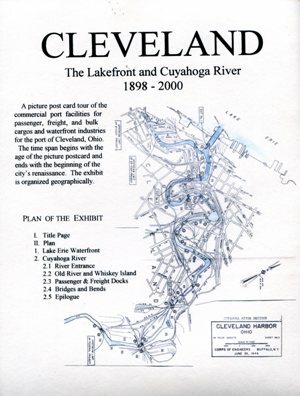 We have only a few of these at the APRL, but Gary Loew has scanned many early lists from microfilm, and Chester Smith has scanned others from the originals. 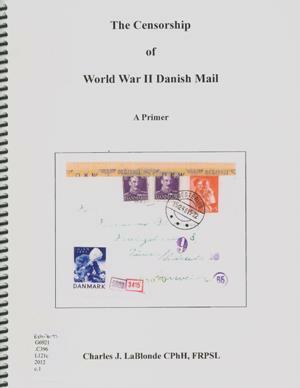 Both generously shared their scans with the APRL so that we could make them available for research. 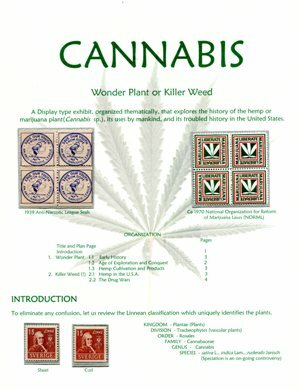 We’ll continue to add more lists and other U.S. Post Office Department documents as we have time. 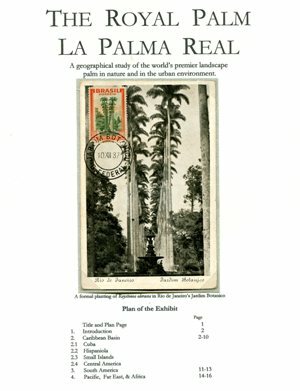 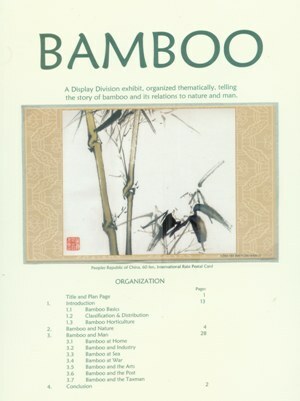 To access the digital copies, search our catalog for the title, click on “Full Record,” then click the link. 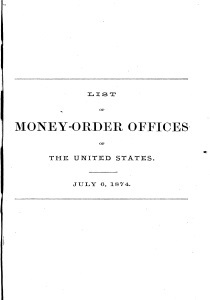 Additional list of money-order offices of the United States [electronic resource] (1872 Jul 15): 6 p.
List of additional Money-Order Offices for July 5, 1875 [electronic resource] (1875 Jul 5): 14 p.
List of money-order offices authorized to issue postal orders on the postmaster at New York for payment in the United Kingdom of Great Britain and Ireland and to pay orders issued by him for sums certified by the Post Department of that country for payment in the United States [electronic resource] (1871 Oct 2): 10 p.
List of money-order offices authorized to issue postal orders on the postmaster at New York for payment in the United Kingdom of Great Britain and Ireland and to pay orders issued by him for sums certified by the Post Department of that country for payment in the United States [electronic resource] (1872 Aug 5): 14 p.
List of money-order offices of the United States [electronic resource] (1870 Aug 1): 22 p.
List of money-order offices of the United States [electronic resource] (1871 Jul 31): 26 p.
List of money-order offices of the United States [electronic resource] (1874 Jul 6): 34 p.
List of offices designated by the Postmaster General as money-order post offices [electronic resource] (1864 Oct 1): 50 p.
Lists of Money-Order Offices: Corrected to September 1, 1886 [electronic resource] (New York:Wynkoop & Hallenbeck, Printers, 1886): 64 p.
Lists of Money-Order Offices: July 13, 1885 [electronic resource] (New York: Wynkoop & Hallenbeck, Printers, 1885): 64 p.
Lists of Money-Order Offices: July 21, 1884 [electronic resource] (New York: Wynkoop & Hallenbeck, Printers, 1884): 58 p.
Roberts, Bruce. 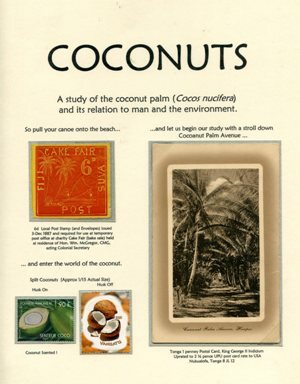 [Scanned images of Tennessee postal history] [electronic resource]: Computer optical disk: col. ill.; 4 3/4 in. 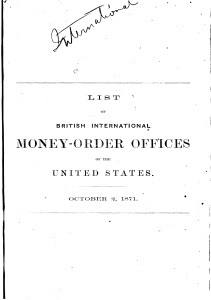 [United States. 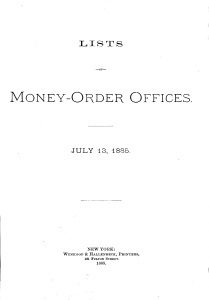 Post Office Department.] 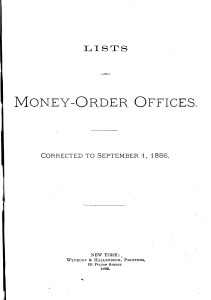 List of money-order offices of the United States [electronic resource] ([Washington, D.C.]: [United States. 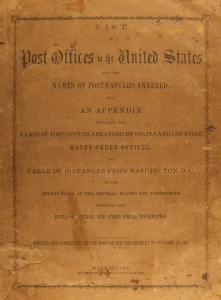 Post Office Department. 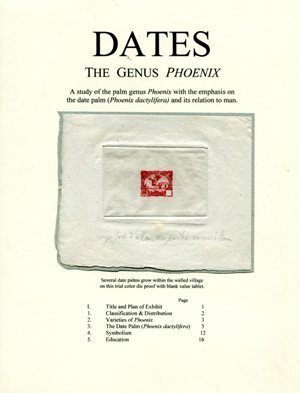 ], 1873 Jul 7): 32 p.
[United States. 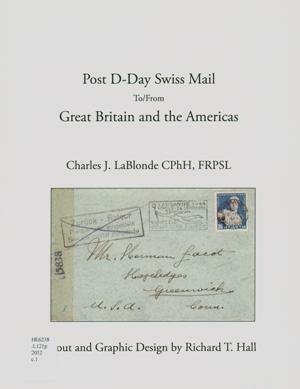 Post Office Department.] 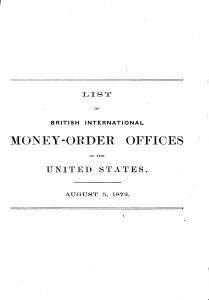 List of money-order offices, June 22, 1876 [electronic resource] ([Boston]: [H. O. Houghton and Company] 1876 Jun 22): 22 p.
[United States. 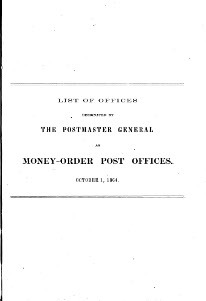 Post Office Department]. 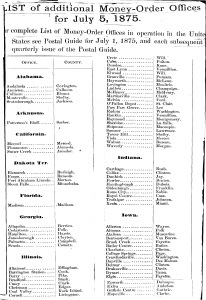 List of Post Offices and Postmasters in U.S., with Appendix Containing Names of Post Offices Arranged by States and Counties, and Table of Distances from Washington, D.C. to County Seats of the Several States and Territories, Etc. 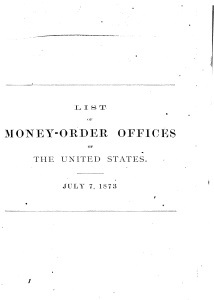 ; Also Money-order Offices, Rates of Postage, and Other Postal Information, Revised and Corrected by Post Office Department to Oct. 20, 1867(Washington [D.C.]: Government Printing Office, 1868): 319 p.